The WORLDWIDE UL-TL-15 safes are made in the United States using the latest in modern technology with superior design and craftsmanship. This sophisticated, state-of-the-art, High Security Composite Burglary Safe provides you with six sides of burglary protection and has passed the stringent testing procedures set forth by Underwriters Laboratories. The Body is a composite (12,000 PSI) single bell cast, one piece design with solid 3 1/2” thick walls. The high density insulating materials incorporated into the construction of the body and door ensure two hours of certified fire protection. The massive 6” thick door houses the impressive three-way active 1 1/2” diameter chrome plated bolts which engage both vertically and horizontally into the cast of the body. The bolts stay in the retracted position when the door is opened and automatically engage when the door is closed. The door has been equipped with self-lubricating ball bearing adjustable hinges that ensure a lifetime of use. The locks used on the WORLDWIDE SAFE are of the highest quality and design available today. The combination lock is a UL-Group 2 three wheel, key changeable combination lock with spy-proof dial which is protected by a massive drill shattering hard plate. The safe also comes equipped with your choice of and auxiliary high security, seven-lever, independent key lock, or a second combination lock. Incorporated into the WORLDWIDE UL-TL-15 is a high security tempered glass plate relocking mechanism, with remotely randomly placed relocking bolt and thermal cords to protect against torch attacks. 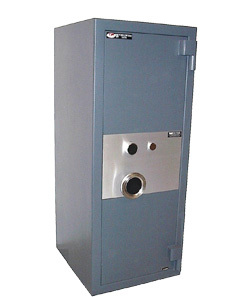 Unlike most safes, the WORLDWIDE UL-TL-15 offers three external spring loaded relockers to guard against punching attacks. The WORLDWIDE UL-TL-15 is finished in a highly advanced epoxy paint that has a built-in anti-corrosive primer. The standard color is a dusk gray with black and stainless steel accents. 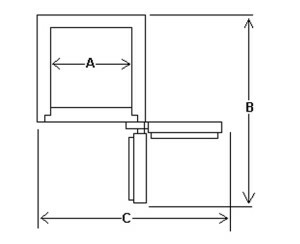 The safes include standard adjustable and removable shelves (see chart on reverse). WORLDWIDE SAFES: Advanced security built to meet and exceed your requirements while providing you, the valued customer, with ultimate peace of mind. This safe was tested by the manufacturer at an independent laboratory in a furnace at temperatures up to1850° F, for a period of 2 hours. Interior Temperature did not exceed 350°.